The wireless gigabit market is estimated to grow from USD 0.30 Billion in 2015 to USD 2.73 Billion by 2022, at a CAGR of 32.9% between 2016 and 2022. The report aims at estimating the size and future growth potential of the market across different segments such as product, technology, application, and geography. The base year considered for the study is 2015, and the market size is forecasted between 2016 and 2022. This report provides valuable insights regarding ecosystem of this market such as product manufacturers and suppliers; OEMs; system integrators; Wi-Fi & WiGig alliances, suppliers, and distributors; WiGig wireless communication technology providers; and so on. The key players in the wireless gigabit market include Samsung Electric Co. Ltd. (South Korea), Qualcomm Atheors (U.S.), Intel Corporation (U.S.), Cisco Systems Ltd. (U.S.), Marvell Technology Group Ltd. (U.K.), Broadcom Corporation (U.S.), Panasonic Corporation (Japan), NEC Corporation (Japan), AzureWave Technologies (Taiwan), NVIDIA (U.S.), and MediaTek (Taiwan). 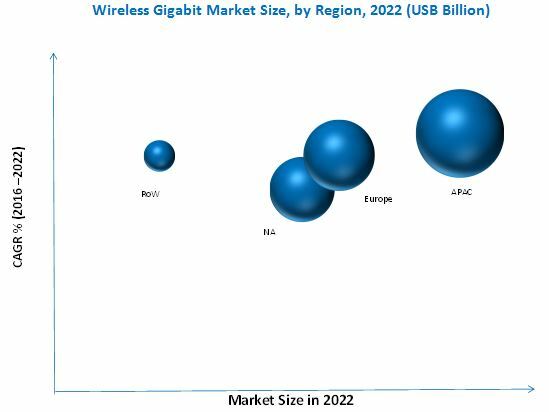 MarketsandMarkets estimates the wireless gigabit market size to grow from USD 0.30 Billion in 2015 to USD 2.73 Billion by 2022, at a CAGR of 32.9% between 2016 and 2022. This market is driven by factors such as the growing SoC & embedded system technology advancements and launch of new spectrums allowing to increasing penetration into emerging economies. Display device products are expected to hold the largest market share and dominate the wireless gigabit market between 2016 and 2022. This segment is expected to dominate the global market by 2022. With the increasing demand for lighter, thinner, and smaller consumer products, SoC has been vastly used since its development. All the devices in the current market from smartphones and tablets to backhaul stations and adapters are based on SoCs. The introduction of SoC was not just restricted to the integration of core functionalities but also to add functions that were initially used through cables or as external devices. It is an integration of chip and the software necessary depending on the end-user requirements. The basic architecture of a SoC comprises both analog and digital elements and their relevant interfaces such as the central processing cores, DSP cores on chip bus I/O peripherals and embedded memory. The consumer electronics application is expected to dominate the wireless gigabit market and account for the largest market share during the forecast period. WiGig products are expected to gain traction in the next seven years due to the increasing demand for these products in different applications such as consumer, commercial, and networking. The APAC region is expected to hold the highest market share and dominate the wireless gigabit market during the forecast period due to the presence of a large number of WiGig manufacturers and their manufacturing capabilities. APAC offers potential growth opportunities. The need for higher data throughput has been a driver for the global market from several years. Gigabit speed wireless networking has always been a goal over the last decade. WiGig and 60 GHz specification defines protocols that promise to deliver transfer rates up to 7 Gbps. WiGig delivers supercharged transmission rates by operating in the 60 GHz frequency band, which has more spectrum available than the 2.4 GHz and 5 GHz bands on which most Wi-Fi–enabled devices currently operate on. One of the key challenges faced by the WiGig market is the high frequency of internal substitution creating a high level market space cannibalization. The major vendors in the wireless gigabit market include Samsung, Qualcomm Atheros, Marvell Technology Group Ltd., Broadcom, Intel Corp., and others. These players have adopted various strategies such as new technology launches, partnerships, and mergers & acquisitions to cater to the needs of the market. 12.5 Marvell Technology Group Ltd. Figure 48 Snapshot of the North American Wireless Gigabit Market: Growth Due to the Presence of Numerous WiGig Manufacturers in the U.S.